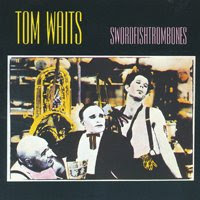 Swordfishtrombones is an album by American singer-songwriter Tom Waits, released in September 1983 (see 1983 in music). It was the first album that Waits produced himself and is marked as such by a sense of artistic freedom that would increasingly characterize his later work. Stylistically different from his previous LPs, Swordfishtrombones moves away from the piano and string orchestra arrangements of the late seventies replacing them instead with unusual instrumentation and a somewhat more abstract songwriting approach. Swordfishtrombones peaked at #164 on Billboard's Pop Albums and Billboard 200 albums chart.In 1989, Spin Magazine named Swordfishtrombones the second greatest album of all time. "Town with No Cheer" was covered by actress Scarlett Johansson on her album of Waits covers, Anywhere I Lay My Head. "Soldier's Things" was covered by singer Angela McCluskey and her band Tryptich on their album, "Curio".